Mark Connery: Hey Marco, so Stroppy is a very beautiful book, a real treat for the eyes, and also your first graphic novel. It's also one of your easiest-to-read things. How long were you working on it? Was there a challenge in finding a groove to make the story move at the right pace? Marc Bell: I was very slow to begin actual work on this book. I did want to make things clearer story-wise because I was sick of being talked about as the guy that makes no sense. I even read a few books about writing storyboards for films and TV to get myself going. I think it did end up clearer than my other works but it also seems it is very hard to escape this piling on in the narrative that usually happens with things I make. So, that's how it goes! I suppose it took three years but only a third of that was making the actual book, drawing it. Maybe it's the size of the book, but at first it kind of reminded me of Tintin, but I also saw more of the Richard Scarry influence in it. I was also seeing more Elzie Segar and a funny kind of Crumb influence on it. Was that work on your mind? Elzie? I was definitely thinking of Scarry and also of Jim Henson. Crumb and Segar are always in there. I like how Segar sets things up: that vaudeville style. I was thinking about the format of the French album as well. Of course. You've been to Europe a few times in the last bunch of years and I was wondering if there were European cartoonists that had influenced it. Hmm, I am not so sure I am that influenced by European stuff that directly but there is a consistency in some of that work that I might have been going for. When I was young I had a copy of Flight 714 (Tintin) and I read that over and over again. I guess in some ways this is a "clear line" style I am using. Stroppy, the feller, doesn't have an easy time of it. And as weird as the Schnauzers are, the only character I really hate is Sean. That dude brings out a lot of anger in me. Did you have models for some of these folks? Well, I am happy you were irritated by Sean. He is the worst. I am happy I have made a character that is so detestable. He definitely represents something that I don't like. The Schnauzers are supposed to be confusing, I guess, I liked the idea of a rock band being this mysterious corporate organization. Just going through the book, and getting grabbed by things, I busted a gut on the "No Horseplay" sign -- I always thought prohibitions on horseplay were very amusing. Are you concerned about horseplay on mini golf courses? Ha, well, I probably share your feelings on horseplay. And it is a funny word. What exactly is horseplay when you are playing? Let's draw a line. I read some review of some graphic novel that praised the artist's stylistic consistency and I kinda thought that was "eh, whatever" but I'm impressed by your consistency in Stroppy. I know you were working on other stuff while working on Stroppy, did that make that consistency harder? I would have to stop and do this or that, of course, but I was mainly working on Stroppy. It was the burden I carried and it was always in the back of my mind ("have to get this done"). And, I had some nice diversions as well, like compiling your Rudy book. I find a musical quality to your work and there's lots of cartoon music in the book -- what were you listening to while you were working on it? I was listening to a lot of stuff, of course: The Cannanes, Henry Flynt, Half Japanese, Can, Crass, Tumasi Quissa, Public Enemy, Celtic Frost, Slapp Happy, The 6ths, lots of stuff. You've sometimes called your work PG-13 -- it can get a bit risqué, but not too raunchy. Is that something you try to do? Or is that your own sweet self at work? I guess it is my own sweet self. I am not sure why my stuff ends up on the safe side. I don't do that on purpose, it just ends up that way. I was criticized once for avoiding it: someone felt ripped off because my work appeared to look like the good ol' undergrounds but upon further inspection it was cleaner than a whistle (by comparison). Having said that, the bits of violence in the book are the most convincing and visceral I've seen you draw. Was that fun? A bit of a breakthrough? Yeah, it was fun to draw that violence. I like cartoony violence…not so into the real dark version. Maybe I am working out some kind of anger in there. It could be some kind of breakthrough… I can picture in my minds eye some more visceral insane version of what I was doing in there with the violence so I hope to tap that. I realized when I was thinking about it, it was less wiggly than some of your other stuff, but in the middle and later middle, it gets pretty wiggled out. How many wiggly lines are ideal? Ha ha, yeah, I think when I first started drawing the book I was a little scared. My return to comics! But, as time went on it started to take shape and once I exerted a certain amount of physical and mental energy on to it I began to relax and get my wiggle on. Some wiggle room. The perfect amount of wiggly lines are ideal but then when you relax too much you could end up with six too many wiggles. And then people's eyes wiggle when they look at it. Then everybody in the room gets wiggly, which I guess isn't so bad. Life's pretty hard for the Stroppys of this world. Do you see things getting better? Or are we doomed to schnauzification? I hope not. It isn't looking great but maybe there will be some kinda swing against the Schnauzers of the world. Marc Bell is now on tour with Anders Nilsen. Check the D&Q web site for all info. Reading Stroppy, I thought the format was heavily influenced by the Daily Express’s Rupert Annuals. 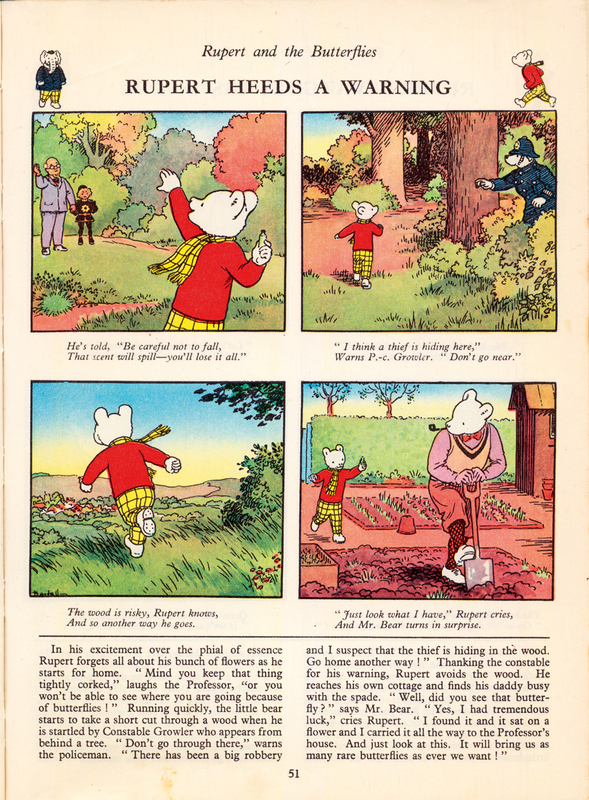 Both books have four panels per page, with a little description of the page’s events at the top, and are printed the same size (which looks about two thirds the size of a Tintin album). However, it’s possible I only think this because Stroppy is set at a “Lord Rupert Manor” and the similarities are just a coincidence.